In the first six months of 2018, the investment in fixed assets (excluding rural households) reached 29,731.6 billion yuan, up by 6.0 percent year-on-year, and the growth rate was 0.1 percentage point lower than that in the first five months. 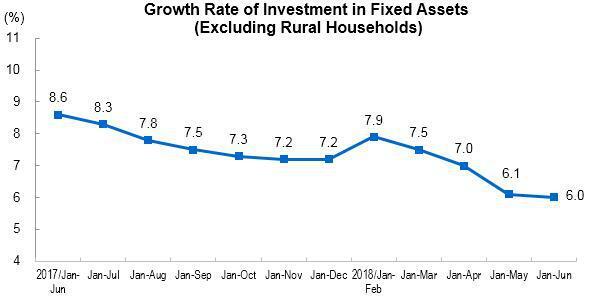 In June, the investment in fixed assets (excluding rural households) increased 0.48 percent, month-on-month. Of which, the private investment in fixed assets reached 18,453.9 billion yuan, a year-on-year increase of 8.4 percent. In term of different industries, the investment in primary industry was 987.2 billion yuan, went up by 13.5 percent year-on-year, and the growth rate was 1.7 percentage points lower than that in the first five months; that of secondary industry was 10,987.8 billion yuan, went up by 3.8 percent, and an increase of 1.3 percentage points; that of tertiary industry was 17,756.6 billion yuan, increased 6.8 percent, and a decrease of 0.9 percentage points. In secondary industry, the investment in industry increased 3.9 percent year-on-year, and the growth rate was 1.3 percentage point higher than that in the first five months. Of which, the investment in mining industry went up by 0.2 percent, while that in the first five months was down by 1.8 percent; that of manufacture increased 6.8 percent, and the growth rate increased 1.6 percentage points; that of production and supply of electric power, heat power, gas and water, decreased 10.3 percent, and the pace of decline narrowed by 0.5 percentage points. In tertiary industry, the investment in infrastructure (excluding electric power, heat power, gas and water) increased 7.3 percent year-on-year, and the growth rate was 2.1 percentage points lower than that in the first five months. Of which, the investment in management of water conservancy increased 0.4 percent, down by 3.5 percentage points; that of management of public facilities increased 5.8 percent, down by 2.8 percentage points; that of transport via road increased 10.9 percent, down by 3.9 percentage points; that of transport via railway decreased 10.3 percent, and the pace of decline narrowed by 1.1 percentage points. In term of different areas, the investment in eastern region rose by 5.5 percent year-on-year, and the growth rate decreased 0.2 percentage points from the first five months; that of central region increased 9.1 percent, and the growth rate decreased 0.2 percentage points; that of western region increased 3.4 percent, a decrease of 0.8 percentage points; that of northeastern region increased 6.3 percent, an increase of 4.1 percentage points. In term of types of registration, the investment by domestic enterprises went up by 6.4 percent year-on-year, and the growth rate was 0.2 percentage points lower than that in the first five months; investment by funds from Hong Kong, Macao and Taiwan went down by 5.1 percent, and the pace of decline narrowed by 0.1 percentage point; and the investment by foreign funds went up by 2.3 percent, while that in the first five months was down by 1.1 percent. Note: The growth rate in this table are all nominal growth rate. Stat-holding Enterprises: including absolutely state-holding enterprises, relatively state-holding enterprises and consultatively state-holding enterprises. Absolutely state-holding enterprises refer to those enterprises that the proportion of state investment capital to the total actual capital (or capital stock) is larger than 50 percent. Eastern region: including Beijing, Tianjin, Hebei, Shanghai, Jiangsu, Zhejiang, Fujian, Shandong, Guangdong and Hainan. Central region: including Shanxi, Anhui, Jiangxi, Henan, Hubei and Hunan. Western region: including Inner Mongolia, Guangxi, Chongqing, Sichuan, Guizhou, Yunnan, Tibet, Shaanxi, Gansu, Qinghai, Ningxia and Xinjiang. Northeastern region: including Liaoning, Jilin and Heilongjiang. NBS performed the industrial classification for national economic activities (GB/T 4754-2017).